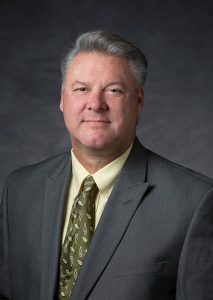 Kurt M. Bozant is a graduate of Holy Cross High School in New Orleans (1981), and the University of Louisiana-Lafayette (1985) with a BSBA degree in Management. Kurt has been in banking his entire professional life, and he is currently the Slidell City Bank President for State Bank & Trust Company. Kurt previously served as a Board Commissioner of the Northshore Harbor Center from 2004 to 2016, including a term as Board Chairman from 2009 – 2011. Kurt has been a member of the Rotary Club of Slidell since November 1995 during which he served in several board capacities including President during the 2000-01 Rotary year. Kurt has served as the Rotary Club of Slidell’s College Scholarship Chairman since 2003. Kurt is a 1996-97 graduate of Leadership Northshore (at that time, Leadership Slidell). Kurt, a resident of Pinewood Country Club in Slidell since 1991, is married to Colette Duffour Bozant. Together, they have 4 sons Blake, Bradley, Brock, Brandt, and a daughter, Courtney. Appointed by the City of Slidell, Term expiring in 2021.